Hollybee Hope is a hedgehog with a prickly problem ... she doesn't have any spines! Her father tells her to be patient, but Hollybee is not a patient hedgehog. She wants to look like a real hedgehog and have spines right now. One morning, when Hollybee finds a brush in a bucket, she decides to take matters into her own hands. Hollybee Hope wants a Prickly Coat is a story of self acceptance, of learning to see being different as an advantage rather than a disadvantage. It is also a story of friendship - the type of friendship for which you'd sacrifice something special. The language is lively and rich, there's a problem that gets solved, and best of all there are lots of cute critters. It also shows all the animals working together to solve the problem and cheer Hollybee up. My kids would have loved it. Sue Copsey, editor. Deborah Hinde has illustrated more than 65 books, both fiction and non-fiction, for children and adults. Her first picture book, A Kiwi Night Before Christmas (Scholastic NZ, 2003), is a New Zealand classic. Since then Deborah has illustrated another 34 picture books. 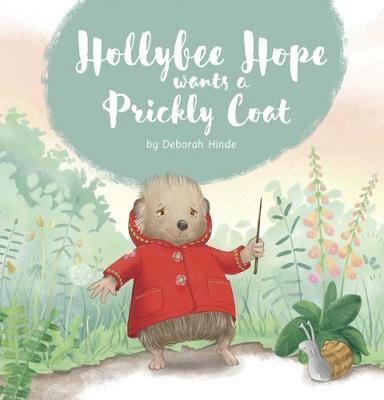 Hollybee Hope wants a Prickly Coat is the second book authored and illustrated by Deborah - her first book Hare was published in 2016. Deborah lives and works from her home-based studio in rural Waikato. Inspiration for Hollybee Hope wants a Prickly Coat came from the hedgehogs and other animals that wander through her garden.